The first third of the book deals with Stalin’s attempt to fulfill this fundamental premise of Marxism-Leninism by forced collectivization and industrialization, at tremendous human cost. As Kotkin makes clear, the policy itself was not a Stalinist aberration, but the will to carry it through (and it could not have been carried through without massive coercion and cruelty) in the face of such colossal human suffering did owe much to Stalin. Kotkin describes this time, with its immense challenges, its horrendous cruelties, its massive tragedies and, yes, its heroic achievements, in great detail. 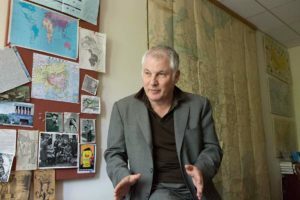 He is no fan of Stalin, but he is not some sort of anti-communist propagandist who is willing to entertain any smear in the service of the larger anti-communist project. For example, he makes clear that while suffering in the Ukraine was immense, it was not a systematic attempt to eradicate Ukraine or Ukrainians, it was part and parcel of what happened to peasants everywhere in the USSR. 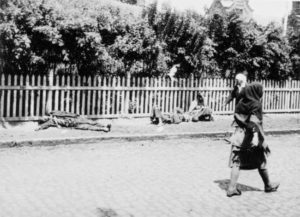 The highest death rates were not in Ukraine, they were in Kazakhstan (where up to half of the Kazakh population were killed via starvation, exposure and illness as the Soviets forcibly “de-nomadized”, collectivized and rationalized (“modernized”) their society) and many parts of Russia saw suffering and death on the same scale as Ukraine. 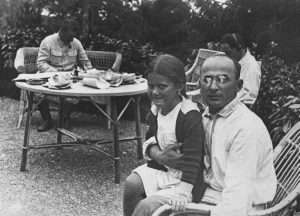 And while Jews, Poles and other peripheral nationalities played a disproportionate role in the Soviet regime, their gravitation to the Bolshevik party is not a total surprise, given that they tended to be oppressed by the Czarist order (and in the case of the Jews, were disproportionately intellectuals; and the pre-1917 Bolshevik party was not really a proletarian party, it was a party of (mostly impoverished, certainly disaffected) intellectuals. 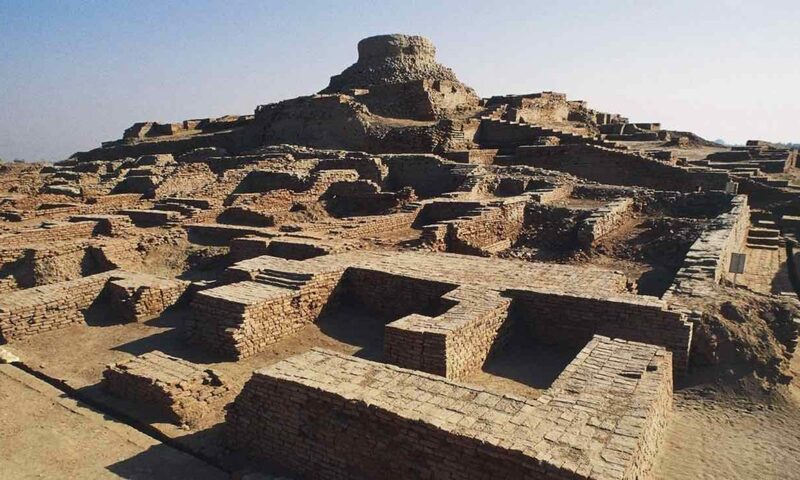 They were also proportionately less among the victims in this stage because they were disproportionately urban, while the suffering in this phase, was mostly rural. 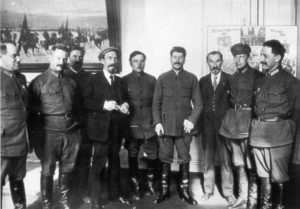 Stalin, with his prodigious appetite for work, personally read the confessions of most high officials, in many cases having personally ordered their arrests. Confessions obtained by torture and sometimes splattered with the blood of the victims were duly presented to him, and marked up by him in multi-colored pencils, and circulated among select members of his inner circle with his comments. In his absence, his leading henchmen (e.g. 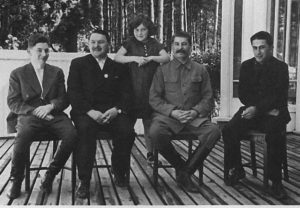 Molotov, Voroshilov, Zhdanov and Mikoyan) signed off on death lists, but the big man generally kept a very close eye on things. He also took sadistic pleasure in forcing his closest and most loyal colleagues to denounce (and therefore, condemn to torture and execution) some of their favorites and even close relatives and friends. Some, like the heavy industry commissar Ordonikidze tried to resist the extension of the massacre to their own domains (though they all supported the purging of other departments) and Ordonikidze ended up killing himself, but most of them joined in, and not just from an instinct for self preservation. There was genuine enthusiasm on the part of some for at least some part of the terror. The book is incredibly detailed (and well sourced and documented) but even this book is not enough to fully grasp all aspects of the terror. The interested reader will have to read several other books to get a truly well rounded picture of this horror. 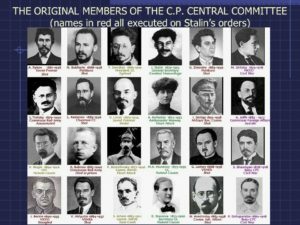 Suffice it to say that the scale of the purge defies explanation; Stalin executed almost his entire military high command, half of his central committee, tens of thousands of loyal party functionaries and scores of thousands of lower level officials, engineers and managers. 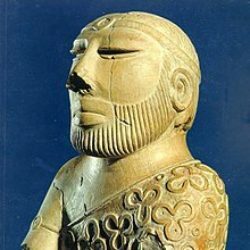 He decimated his own army and intelligence service, decapitated the foreign service and undermined intelligence gathering operations all over the world; the sheer scale and indiscriminate nature of it is examined from operational, ideological or even personal psychological angles, but by all of these criteria, it still fails to make sense. Most of those killed were loyal party members and almost all of them were innocent of the fantastic crimes they were forced to confess to by NKVD torturers (though it should be noted that most of the higher officials and NKVD operatives were guilty of having killed many innocents during the civil war and collectivization). The details are horrendous but they are also worth reading. There have been other reigns of terror in history, but none that really matches this one in its ferocity, its apparent pointlessness, and its iterative cycle of auto-annihilation, with betrayers and accusers soon ending up facing the same fate as the friends and colleagues they had just betrayed. Ultimately, Yezhov and Frinovsky, the very top people in the NKVD who carried out the worst of the terror, were themselves arrested and tortured (and duly confessed to the same fantastic crimes), before being shot by the same executioners (over the course of the terror, the NKVD arrested more than 20,000 of its own employees as suspected traitors). Kotkin explores many factors that led to the purge, but no single factor fully explains it: Stalin’s increasing personal paranoia, the fundamentally paranoid nature of the Leninist state, the existence of a coercive apparatus that could extract confessions from anyone, and that then ended up arresting and getting confessions from everyone named in the first fake confession; even the urge to replace existing functionaries with younger and better men, all these probably played a role, but no explanation is fully satisfactory. No wonder Yuri Slezkine fell back on a primarily religious explanation, more akin to scapegoating and witch hunts than rational statecraft. There is much more in this amazing book; for example, we learn in great detail about Stalin’s daily routine (he was an insomniac and the high command adjusted to his schedule, the day starting at 3 or 4 PM, with meetings until late into the night, frequently followed by long sessions of chatting, eating, drinking, listening to music and dancing; he never danced, but he did make his subordinates dance), his personal life (loving letters to his wife, but also arguments, and finally her depression and suicide, followed by his very real grief), his children (his sons were mostly neglected but when he could, he doted on his daughter; he did not try to promote any of his children and scolded school and military academy officials who tried to curry favor by writing gushing reports about them), how he picked his office director (Proskryobishev, like Stalin, the son of a cobbler, who was told upon his selection “you have a frightful look about you, you will terrify people”), who he relaxed with (first Lakoba (who was later sidelined and probably poisoned by Beria), then Kirov (who was shot by a down and out expelled party member, Kotkin thinks without Stalin’s involvement) and so on. We learn how prepared he was at meetings (very well prepared indeed), what he liked to drink (mostly Georgian wine), what he smoked (cigarette tobacco in a pipe), his taste in the arts (he gravitated towards folk music, but also enjoyed classical music, ballet and theater; he read widely, assiduously promoted writers and artists, was very interested in the cinema, and so on), and his mastery of detail (including detailed knowledge of modern weapons and an ability to ask pertinent and very probing questions of technical personnel who presented him with information). I could go on and on, but this is an 1100 page book and you will have to read it to get the full benefit of it (and I strongly recommend that you do). 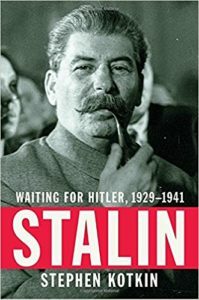 True, Stalin was waiting for Hitler. 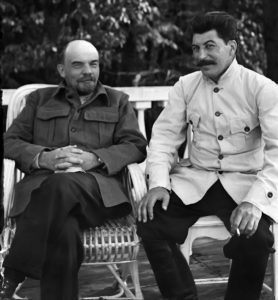 When Operation Barbarossa came, Stalin was found napping. Disastrous Soviet losses in the 1st year of Barbarossa can be directly attributed to Stalin USSR had every chance of losing the war. Soviets survived by the skin of their teeth. Hitler completely outwitted , outgunned and outfoxed Stalin in 1941. 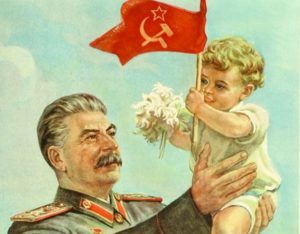 Stalin was a victim of his own cynicism with very little accountability.